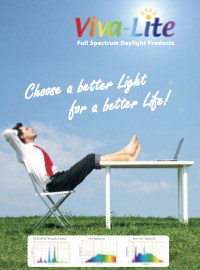 Viva-Lite® Full & Daylight Spectrum Energy Saving Lamps, Tubes and Halogens. When we started Viva-Lite®, we wanted to create a complete full spectrum range using the various lamp styles that are available in the market today while bringing them together under the roof of one high-quality and reliable full spectrum brand. Even though our various lamps are based on different technologies and therefore suit different applications respectively, we still follow that original goal. This enables our customers to simply change light bulbs instead of having to buy completely new fixtures! Bases available E27, E14, B22 T8, T5 2G11, GX24-q3, GX23 E27, E14, MR16, GU10, etc. As already indicated in the chart, depending on the product's usage and field of application, some Viva-Lite® items suit a lighting situation more than others: For example it is very unlikely that you would use the same fixtures in your office and bedroom. Therefore Viva-Lite® Full Spectrum Lights provide flexible solutions for various lighting scenarios and the following detailed information might help you choosing. An energy-saving lamp with the full colour spectrum of sunlight, including some vital UV constituents. Economic and design-wise alternative to the conventional low-consumption lamps with the added healthful advantages in respect to performance, visibility and well-being. The brilliant white light (colour temperature 5500 Kelvin) radiates like a ball of light, similar to light bulb and offers excellent lighting values. Flicker-free instant start, non-flaring operation. Power saving up to 80%. Viva-Lite® Full Spectrum ESL are available in spiral and candle shaped forms and for the following caps/bases: E14, E27, B22 in 230VAC and 110V options. The Viva-Lite® full spectrum tube lights were developed to simulate natural daylight in closed rooms. This full spectrum lamp style was first used in space flights and in submarines. However today they are seen also in many shops, companies offices and in homes where every time they shine anew to reproduce colours true to nature with natural spectrum (including UV-A/UV-B) and their positive effects on body and mind. Near identical colour reproduction of natural sunshine. Excellent colour temperature in optimum daylight range (5500 Kelvin). Best contrastive vision and sunshine-like shadow formation. Less error rates and increased productivity of personnel. Less absenteeism due to illnesses. Viva-Lite® Full Spectrum Tubes are currently only available in 220-240VAC and for T5 and T8 fixtures. A combination between the energy saving lamps and the tubes, the modern Viva-Lite® full spectrum CFL lights exhibit excellent properties in both light output and full spectrum. natural dayling rendering (5500 Kelvin). Viva-Lite® CFL's are available in different shapes and sizes such as PL, TCL, 2G11, GX24, G7 and many more. For using the full spectrum halogen lamps there are ample reasons: their colour rendering resembles that of the sun up to 98%. It means continuous and harmonious reproduction of colours and an optimum shadow formation. The light distribution is absolutely uniform and no spots and patterns as in other cold light reflectors. The illuminated objects present an outstanding display. Compared to a standard halogen lamp, the Viva-Lite® full spectrum halogen lamp has a much lesser infrared component in the beam of light which reduces heating considerably therefore reducing a possible "braising" or a "bleaching" effect on the illuminated objects. Fits into any 12V-20W/35W/50W low-voltage – Halogen lamp (Reflector). Standard MR16 – socket. Also known under GU (GX) 5,3 or QRCBC 50/51. Experience colours true to nature. Possibly the best colour reproduction you have ever experienced. Soothing to the eyes, improves your performance. Best suited for illuminating images/objects directly. Excellent in infrared as well as ultra-violet range. Superb continuous and balanced spectrum. We are continously improving our model range and light spectrum. Please ask if you are looking for something special. If you have any questions, please do not hesitate to let us know. Also see further detailed information on the right hand side of this page. We hope you enjoy your visit on our homepage. We value your Comments.